Adjective & noun. In branch AI, capitalised; in branch AII as an adjective, uncapitalised; in branch B, capitalised. Late Middle English. 4(c) obsolete. Common, prevalent. Only in 17. Catholic is a curious word. When capitalised, it refers to the Catholic Church, and especially the Roman Catholic Church. When uncapitalised, however, it loses all religious connotation and means universal, broad-minded and all-embracing; except, of course, it doesn't lose its religious connotation, and were I to describe myself as catholic in conversation, it would almost definitely be understood that I'm saying I am Catholic. And it isn't just that the two meanings are confused - for many, they seem mutually incompatible, with the Catholic Church historically being anything but all-embracing, tolerant and broad-minded (William Tyndale, for example, was persecuted by the Catholic Church for translating the Bible into English so that it could be read by the common man). Both forms of the word originate from the Greek katholikos, meaning 'universal, general'. Various churches use the term catholic, including Eastern Orthodox, Oriental Orthodox, Anglican and Lutheran churches, while separating themselves from the Catholic Church. The first known reference to a catholic church was in a letter by Saint Ignatius of Antioch to Christians in Smyrna in 110 A.D, and later Cyril of Jerusalem (c. 313-386 A.D) also used the term catholic to differentiate between the true church and other denominations that were splitting away. However, it was after the East-West Schism, when Chalcedonian Christianity split between Western (Latin) and Eastern (Greek) branches, that the Catholic Church became a denominator for what is now the biggest Christian denomination in the world, headed by the Pope and comprising of some one billion adherents. A senior member of the Christian clergy, usually in charge of a diocese and empowered to confer holy orders. Bishop comes from Old English biscop, ultimately a variant of the Greek episkopos, meaning 'overseer'. A cardinal is a leading dignitary of the Catholic Church, cardinals are nominated by the Pope, and subsequently elect succeeding popes, now invariably from within their own number. Cardinal comes from the Latin cardinalis, from cardo, cardin-, meaning 'hinge', being used in Catholic terminology as the cardinals are seen as hinges, or pivots, in the church due to their important function. A cathedral is the principle church of a diocese. The word was originally cathedral church in full, meaning 'the church that contains the bishop's chair,' coming from the Latin cathedra (Greek kathedra) for 'seat'. Charity is a central Christian and Catholic tenet, the word coming from Old English and originally meaning 'Christian love of one's fellows'. Its root is ultimately from Latin caritas, from carus 'dear'. A church is a building used for public worship, and a Church is a particular Christian organisation with its own hierarchy, beliefs, etc. Church arrived in English from Old English cir(i)ce, based on medieval Greek kurikon meaning 'Lord's house' (from kurios 'master' or 'lord'). The clergy is the body of people ordained for religious duties, such as priests, cardinals, etc. It comes from Latin clericus 'clergyman', which itself is from Greek klerikos which is from 'lot' or 'heritage', based on Acts 1:26 in the Bible. A deacon is an ordained minister ranking below a priest. Ultimately, the word comes from the Greek diakonos meaning 'servant'. It's from Greek dioikesis 'administration, diocese', from dioikein meaning 'keep house, administer'. The Eucharist is the Christian service that commemorates the Last Supper, in which bread and wine are consecrated and consumed. The word comes from the Greek eukharistia 'thanksgiving', from eukharistos meaning 'grateful'. The gospel is the teachings of Jesus Christ. It's from Old English godspel, from god 'good' and spel 'news' or 'story'. Therefore, gospel literally means 'good news'. Controversially taught by the Catholic Church to be a place of eternal damnation, often described as a realm of evil, fire and suffering. The word hell (often written Hell) is from Old English hel or hell, from an Indo-European root meaning 'to cover' or 'to hide'. The Holy See (also The See of Rome) is the papacy of the papal court, and those associated with the Pope in governing the Roman Catholic Church at the Vatican. The liturgy is the form of public worship prescribed by the Church. It's from Greek leiturgo, meaning 'minister', from leitos 'public' with ergos 'working'. Mass is the celebration of the Eucharist. It originates from ecclesiastical Latin missa, from miss- meaning 'dismissed'. This is perhaps from the final words of the service: "Ite, missa est," meaning "Go, it is the dismissal." The Pope is the Bishop of Rome, the head of the Roman Catholic Church. It is from ecclesiastical Greek papas meaning 'bishop, patriarch', papas being a variant of Greek pappas meaning 'father'. 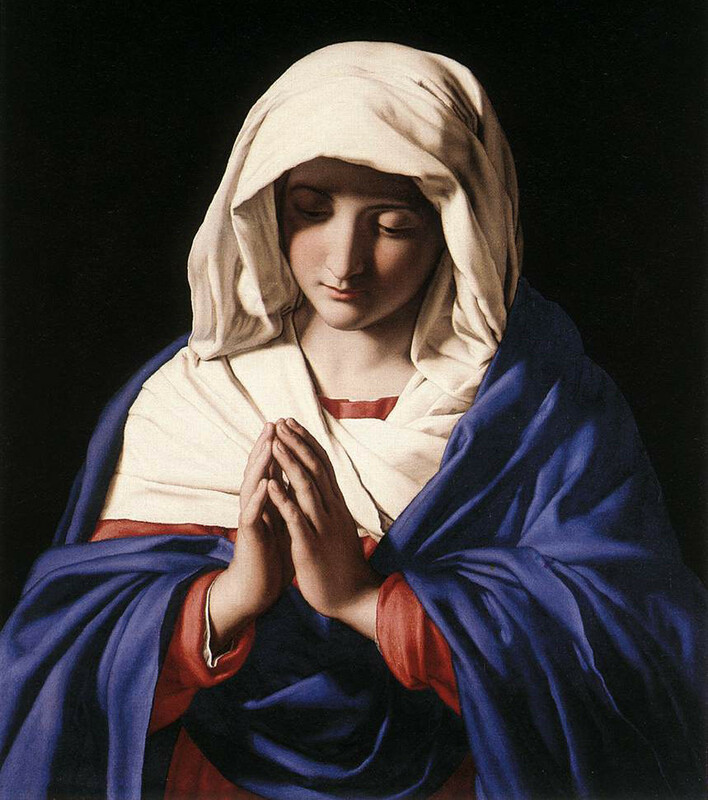 A form of devotion in which five or fifteen decades of Hail Marys are repeated, each decade preceded by an Our Father and followed by a Glory Be. 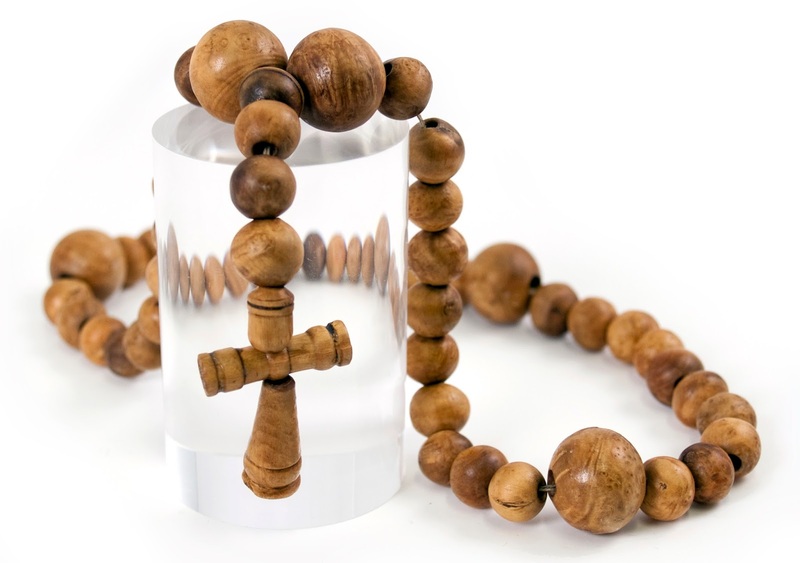 Also, a string of beads for keeping count in a rosary. Rosary is derived from Late Middle English 'rose garden', from Latin rosarium. 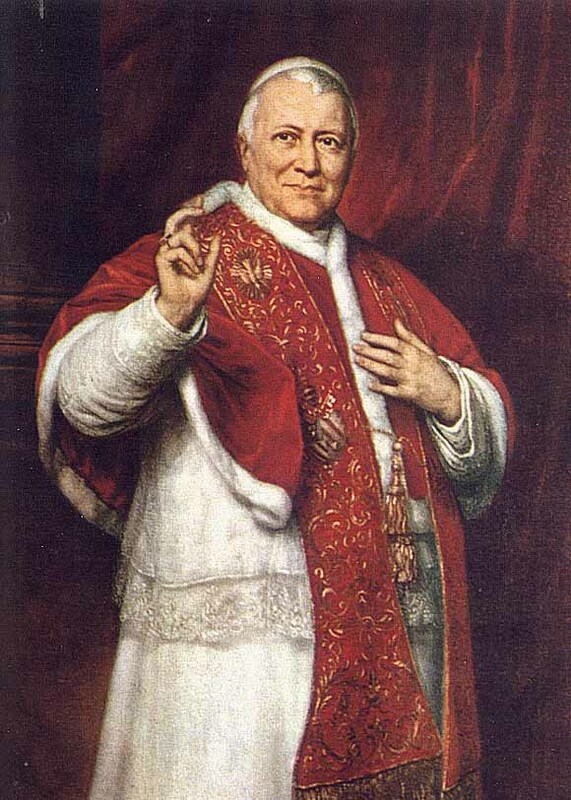 A person believed by Catholics to have been holy and virtuous in life, and who has gone to heaven in death and is now exalted and possibly an object of veneration. The Catholic Church says it does not create saints, but only recognises them. The word originates from Latin sanctus meaning 'holy'. An assembly of the clergy in a diocese, sometimes including members of the laity. The word originates from Greek sunodos meaning 'meeting'. The Trinity is the teaching that God is comprised of three beings: the Father, the Son and the Holy Ghost. It comes from Latin trinitas, meaning 'triad'. Sacrament has various uses depending on the denomination. In Catholicism, the Holy Sacrament (or Blessed Sacrament) is the consecrated elements of the Eucharist, particularly the bread and the wine. It come from the Christian Latin sacramentum meaning 'solemn oath', which was a translation of the Greek musterion, meaning 'mystery'. Note: Many of the above terms are not exclusively Catholic, but they've been included as words often used when discussing matters relating to the Catholic Church. If you feel there have been any omissions, do please feel free to comment below. I in awe with your choice of word today - it's Ash Wednesday. Tonight I'll attend Mass and will have ashes put on my forehead - ashes that come from burning the palm tree's branches of previous year's Palm Sunday - and for Catholics this marks the beggining of Lent. This lent I want to live this one: "Having sympathies with all; all-embracing; broad-minded, tolerant". I'm glad you enjoyed it, Teresa. It's always a bit of a coincidence when words happen to coincide with something going on out there in the real world - a little like when Evi commented that 'caseous' (cheesy) was a good choice for Valentines Day. It was only when I saw your comment that I realised it was Ash Wednesday!